PETROPAVLIVKA, Ukraine -- Mayor Natalya Voloshina thought things couldn't get much worse after mangled body parts and suitcases from Malaysia Airlines Flight 17 rained down on homes and buildings here in mid-July. 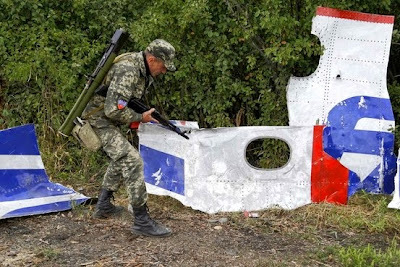 A Pro-Russia rebel looks at pieces of the Malaysia Airlines Flight 17 plane near the village of Rozsypne, eastern Ukraine. In the days since the Boeing 777 exploded, the village of about 800 people has found itself gradually gutted by the ugliness of fighting between Ukrainian forces and pro-Russia rebels. The electricity has cut out. Artillery fire has destroyed people's homes. The roof of the newly renovated preschool, a point of pride for Ms. Voloshina, a former math teacher, was partly blown off in flames. Much of the debris from Flight 17 has stayed scattered where it landed—a reminder of the day the village took its radical turn for the worse. "We've had constant fighting and artillery shelling," Ms. Voloshina said. "People are sleeping in their basements. Many have left." As she spoke, rebel fighters in fatigues kept positions in the woods beyond the village. One local militant had grenades strapped across his torso, ready to load into his launcher. Ukrainian forces lurked just a few miles away, the fighter warned, and any moment could attack. The downing of Flight 17 came as a harbinger of misfortune for people in and around the three rebel-held villages where the remains of the plane and its passengers landed July 17. Before, violence had spared the gritty mining and agricultural towns. But the crash site has since transformed into the front line. Fighting has continued sporadically nearby despite a cease-fire signed last Friday. Few locals believe in the intentions behind the pact, which some see as a farce and others view as a cruel tease. As Dutch investigators released their preliminary report on the Flight 17 disaster on Tuesday, Ms. Voloshina prepared to make a medicine run to a nearby city, hoping that she might be able to take advantage of a tenuous peace to find drugs for elderly villagers running perilously low on supplies. In Rozsypne, the neighboring village where the cockpit and many bodies from Flight 17 landed, the local Orthodox priest was waiting Tuesday for parishioners to show up for the midday service. But no one was coming. Much of the village has fled. Others are too scared to leave their homes. Rain poured outside as Father Oleg sat patiently on a bench with his cane inside the empty hall. About two weeks ago, part of what the priest described as a cluster munition came flying through the top of the church, setting its roof alight and driving a hole through the ceiling. Outside on the lawn, the onion dome that once adorned the roof stood out of place in the yard. Pieces of shrapnel had pocked holes in its sides. The priest considered himself lucky compared with an Orthodox congregation in the nearby city of Kirovske, where an artillery shell recently smashed into the church during a service, leaving at least three parishioners dead and others wounded. Such events have stoked local resentment toward Ukrainian President Petro Poroshenko, already an unpopular figure in these Russian-speaking parts. Ukraine's armed forces have come under heavy criticism for repeatedly hitting civilian areas in rebel-held territory with imprecise artillery fire. Ukrainian military officials have blamed the rebels for similar transgressions, but locals in villages such as Rozsypne tend to blame Kiev. Some suspect western Ukrainian soldiers of trying to run them out of the country altogether. "We are afraid because any day a new present could fly in from Uncle Petro," Father Oleg said, referring to the billionaire president. On the railroad tracks behind the church, 57-year-old retired miner Ivan Savin walked beside a giant crater formed by a munition. He jumped as thunder from the rainstorm boomed, fearing that the village, where his family has lived for generations, once again was coming under attack. "I have three granddaughters, the oldest is 10 and the youngest is less than one, and they have psychological damage from this," Mr. Savin said. The oldest now runs to him at the sound of loud noises. "She says, 'Grandpa, is that one heading toward us or not toward us?' and I tell them to run in the cellar, and we'll figure it out later," he said. The retiree's monthly pension of 2,500 hryvnia ($193) has stopped arriving, leaving him and many other elderly residents low on cash. He bristled at the idea of rich Ukrainian officials in Kiev commanding the country's military against a village like his. "They have so many millions they can't even count them, and we're living here in poverty," Mr. Savin said. Now he said the village is living in fear. "I worked in a mine for 25 years and thought I wouldn't be afraid of anything," he said. "And here I am scared—scared for my family, for my grandchildren." Media from around the world descended upon Rozsypne after the crash of Flight 17 and interviewed hundreds of traumatized locals about the fate of the airliner's 298 passengers and crew. But the deaths of the two villagers who perished amid the fighting about a month later went largely unnoticed, subsumed into the list of hundreds who have died in the five-month conflict. One was a middle-aged woman who walked outside in search of a cellphone signal, only to bleed to death after being struck by an artillery shell, said Father Oleg. Another was a middle-aged man who worked at the local grain factory, and left the building to receive a package from his wife, where the two were hit by an explosion that left him dead and her seriously wounded, the priest said. The mayor separately confirmed two villagers had died. The debris of Flight 17 didn't ruin any buildings or kill any people on the ground when it fell—something residents considered a miracle at the time, seeing as so many pieces landed so close to people's homes. But the subsequent fighting has been less kind. Down the road from the church in Rozsypne, homes are burned out from explosions. In Petropavlivka, Ms. Voloshina said about 10 buildings had been hit, including villagers' homes. Like most other residents, the mayor has watched the war put her life on hold. Municipal funds have dried up, leaving no money to pay her salary, and the coal mine where her husband worked has ceased operations like most others across the region. The circumstances come as a drastic change for a couple that just a year ago had the means to send both their children to college in Donetsk, just 1½ hours down the road. The children have now left for Russia. Her son found a construction job and her daughter a child-care position, work that will help keep the family afloat. College already seems a distant luxury of the past. The fighting keeps interfering with the cellphone coverage in the village, leaving the parents cut off from their children at some of the scariest moments. For Ms. Voloshina, who recently spoke of her children's studies with pride, the change seemed to be a source of heartache. She said: "Our kids have had to become grown-ups very fast."